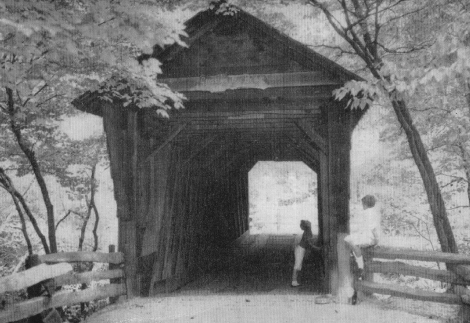 Of the early covered bridges built in North Carolina, only two remain. The oldest of those, Bunker Hill Covered Bridge, was constructed in 1900 and is still standing strong. The 90-foot bridge, which crosses an expanse of Lyle Creek in Catawba County, had been built five years earlier as an uncovered passage, but local leaders soon commissioned the walls and roof to shield the structure and travelers from the elements. For its time, the bridge’s design was cutting-edge, using an improved lattice truss architecture patented by Herman Haupt, a Union Army brigadier general who was chief of military railroads during the Civil War. Haupt’s design was touted as elegant, efficient, and ultimately more resilient to structural strain than prior models—a claim that has stood up through the years. The bridge connected the old Island Ford Road, a route steeped in history. Carved out along a former Native American trail, the path was traversed by Revolutionary War soldiers and some 500 British prisoners after the 1781 Battle of Cowpens. Now owned by the Catawba County Historical Association, the bridge was refurbished in 1994. It no longer supports vehicle traffic—buggies and cars were banned in the 1940s—but visitors are welcome to stroll through it during daylight hours after leaving their cars at the Connor Park lot off U.S. 70, two miles east of Claremont.